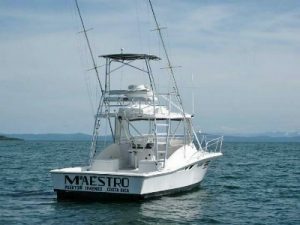 This 36ft Luhrs Express powered by twin inboard diesel engines fishes out of Puerto Jiménez. Captain Oscar Villalobos is at the helm, assisted by an experienced mate. Cruising at 28 knots, she has a full Tuna tower, cabin, enclosed head and a full fighting bridge, along with a chart plotter, fish finder, sonar, GPS, radar, outriggers, live bait well and VHF radio. The fishing equipment includes Shimano and Penn International tackle 50s, 30s, 20s and 15s. Fly fishing gear can be carried on request. The boat has all USCG and Costa Rica Coast Guard-approved safety equipment, including life vests and fire extinguishers. Pick-ups in Golfito can be arranged.